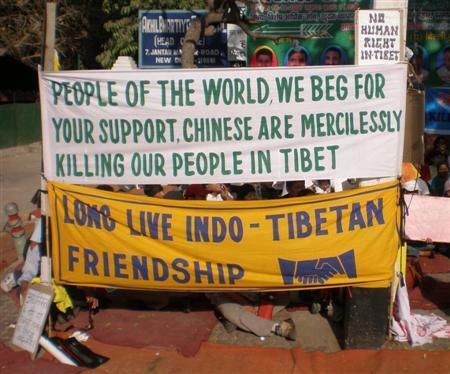 After decades of repression, the Tibetan people are crying out to the world for change. The Olympic spotlight is now on China, and Tibetan leader the Dalai Lama is calling to end all riots and violence through restraint and dialogue. China’s hardliners are lashing out publicly at the Dalai Lama – but many Chinese leaders believe dialogue is the best hope for stability in Tibet. The government is right now considering a crucial choice between repression and dialogue that could determine Tibet’s – and China’s – future. We can affect this historic choice – President Hu Jintao values China’s reputation, and he needs to hear from us that the ‘Made in China’ brand and the upcoming Olympics in Beijing will succeed only if he chooses dialogue over the hardliners’ repression. An avalanche of global people power is moving to get his attention. In just one week, over 1 million people have signed the petition, which will be delivered in rallies at Chinese embassies worldwide on Monday – click here to join the global outcry, and then forward this email to friends and family right away. In just 7 days over 1 million of us have signed the petition calling for human rights and dialogue in Tibet–the fastest growing internet petition in history. As the crisis continues, it’s time to deliver our petition and make sure Chinese President Hu Jintao hears our voices. An International Day of Action has been declared for Monday, March 31st. On Monday, thousands of people in cities across the world will march to Chinese embassies and consulates, and stack hundreds of boxes containing this petition outside them. 1 million signatures makes a mountain of boxes – it will send a powerful global message. 2 millions would be even more powerful. Courtesy: Avaaz, an independent, not-for-profit global campaigning organisation. Dear people, Tibet will only be saved if the people rise now and do something and not keep waiting for orders, that will never come.